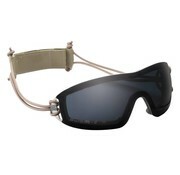 INFANTRY tactical goggles are equipped with polycarbonate glasses . As a result, they are resistant to evaporation and scratches . Tinted glass protects against UVA, UVB and UVC radiation . Thanks to the adjustable strap , you can adjust the glasses to your head.The product is suitable for wearing under a helmet .